A staple on Whyte Avenue since it opened in 2012, you can arguably say that MKT Beer Market has literally cornered the beer market in Edmonton. Considering that it has a robust beer selection of more than 125 beer styles on tap or in bottles, as well as more than 10 local beers on tap or in bottle, it’s at least in that conversation. As part of the Century Hospitality Group, it’s always looking to capitalize on trends and introducing new and bigger items to their menu. Justin McGloin, executive chef for MKT, nods and agrees with Pennock. McGloin explains that Oktoberfest also transitioned nicely into the tremendous energy that was shared by all of Edmonton during the Oilers eventual playoff run. He states that they were full to capacity with patrons more than two-to-three hours before puck-drop, and still remembers all of the guests singing the national anthem. Both agree that beer and sausage make for some of the best pairings during hot summer days, at a BBQ with friends, or even washing down some good premium meats with a strong lager. For cooking, they both agree that pairings are mostly up to the individual, such as simmering the bratwurst in an imperial stout to keep it moist, or adding a stronger, darker beer to impart different flavours while it cooks. However, for eating, both say that a lighter lager really helps to cut through the fat and salt content, especially for heavier meals such as sausage. 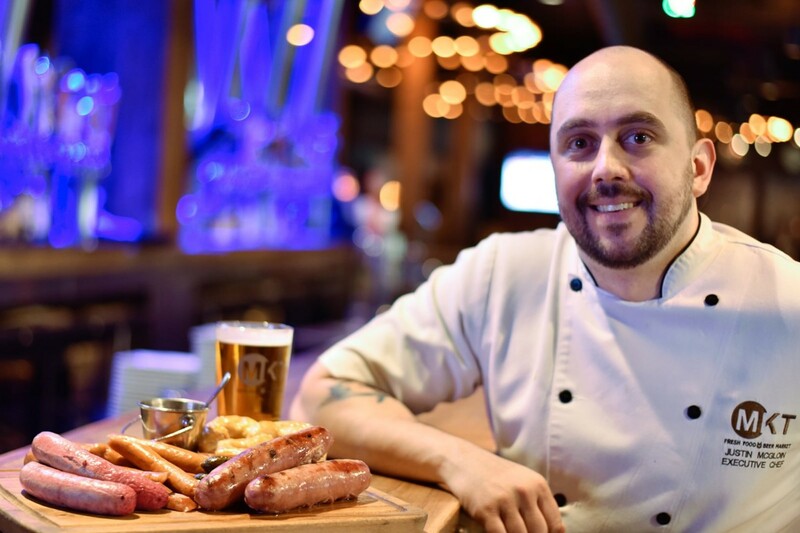 They also point out that having a diverse meat supplier, such as Mundare Sausage, is key for meeting different tastes, and have carried its products such as bratwurst, Thuringer, and of course, its world famous sausage. As summer quickly approaches, they recently revealed a new menu that they are confident will appeal to many different demographics, such as the new introduction of chicken and waffle cones. They also introduced Alberta tap prices at $2.24 for Tap That Thursday; the lowest legal price MKT can sell beer, just so they can pass savings on to their guests. MKT has some big ideas for its patio that are bearing fruit this summer, such as beer collaborations with Situation Brewing (SB) and Wood Buffalo Brewing Co. (WBBC). Pennock says that, like Mundare Sausage, they care about giving back to their community. Both beer collaborations also support local causes with $1 donated to YESS from every sleeve sold of SB Saskatoon Sour. Then another $1 donated to Plaid For Dad from every sleeve sold of WBBC Berliner Weisse. So, order up some summer brews and take part of empowering Edmonton youth or helping to fund research in an effort to protect men against prostate cancer. Expect to see Mundare Sausage play a role in more MKT events that will offer a more traditional and authentic experience to guests. And you can bet that it will include good beer and awesome sausage. Hit up MKT for some local brews, and spend some time with friends on the patio or inside in the shade. The experience is definitely unique and catered for the beer and sausage lover.